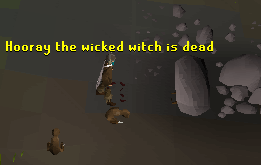 The hunter skill is a very interesting skill in RuneScape, giving you the ability to track, set traps, and catch all sorts of creatures that you would otherwise be unable to interact with. It takes patience though, and you'll need to start small and work your way up to the tougher creatures - but it's worth it! 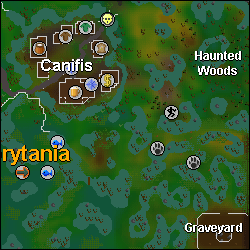 To start off the Hunter Skill, go to either Nardah or Yanille, and head towards the hunter shop. Aleck runs the shop in Yanille where you will also find Leon who will sell you a Hunters' Crossbow for 1,300gp. To make the Bolts for the Crossbow you will need Kebbit Bolts made from Kebbit Spikes and Long Kebbit Spikes. The Hunters' Crossbow requires 50+ Ranging to wield and gives a range bonus of +55. The Hunters' Crossbow also fires faster then normal crossbows, but in turn cannot hold enchanted bolts or spikes. To make 6 Kebbit Bolts you need to give Leon 1 Kebbit Spike and 20gp, or 1 Long Spike and 40gp for 6 Long Kebbit Bolts. At 32 Fletching you can fletch Kebbit Bolts by using a Chisel on Kebbit Spikes, at 42 Fletching you can fletch Long Tipped Kebbit Bolts by using a Chisel on Long Spikes. 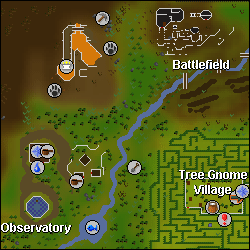 Advisory to begin hunting is to go to Yanille first because it's closest to the first creatures you can hunt. Butterfly Net 15 24gp For catching butterflies. Butterfly Jar 15 1gp For holding butterflies. Magic Box 71 720gp For catching imps. Noose Wand 1 4gp For catching tracking creatures. Bird Snare 1 6gp For catching birds. Box Trap 53 38gp For catching box trap creatures. Teasing Stick 31 60gp For catching pitfall creatures. Unlit Torch 39 4gp For removing your scent. Rabbit Snare 27 18gp For snaring rabbits. Bait - Certain creatures are attracted to certain bait more than others. Smell - When you reach level 39 Hunting, you can smoke the trap in order to improve your chances of capture. Appearance - If you are wearing clothing made out of the fur and skins of creatures in that region the more likely they are to fall into your trap, mainly because the creatures have a tendency to be wary around people. Distance - It's recommended that you stay at least 5 spaces away to improve your capture. Note: Hunting grounds located to the north. Jungle Tracking: Head south of Gu'Tanoth, located southwest of Yanille, and search bushes, trees, and burrows. Woodland Tracking: Either walk around Eagle's Peak, or take the boat to the Piscatoris Fishing Colony and head south. Once again search bushes, burrows, and plants. As seen in the image above the tracks lead to a snow drift. 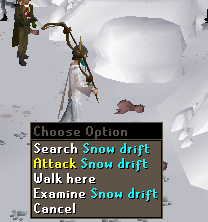 Don't search the snowdrift, but instead, search other nearby exits to find the next part of the track. 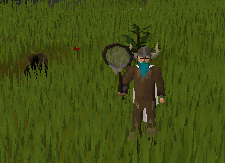 Butterflies may also be caught barehanded for some more hunter experience along with agility experience. For information about catching butterflies barehanded, check out our Barehanded Butterflies guide. You may only set one deadfall trap at a time. At level 39, you can use a lit torch with your Deadfall Trap to remove your scent and increase to chance of capturing your prey. When you use meat, use raw bird meat, because if the creature is trapped, you recover the meat, saving a lot of bank runs and it is good for training. You can also set up bird traps with your deadfall traps to restock when the occasional kebbit steals your meat. Box trapping is used to hunt Ferrets, Chinchompas and Carnivorous Chinchompas. Chinchompas can be found in the woodlands, and Carnivorous Chinchompas can be found in the Jungle. 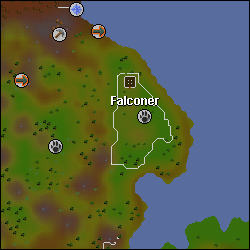 Ferrets can only be hunted once you have completed the Eagles' Peak Quest. They require level 27 to catch, and are only found in the woodland region near Nickolaus' tent. During a period of time without catches your boxes will fall over and you will need to reassemble them. If you make a successful catch the box will turn into a Shaking Box. At level 39, you can use a lit torch with your Box Trap to remove your scent and increase the chance of capturing your prey. 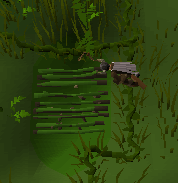 Unlike other hunter creatures, Pawyas and Grenwalls completely ignore your trap if you do not bait it. Geckos, Raccoons and Monkeys also require a certain Summoning level to hunt. 10, 80, and 95 respectively. Skillchompas can be used as skilling tools. 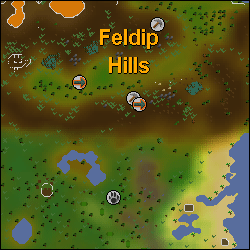 Skillchompas are thrown at various skilling nodes and locations and will benefit your gathering performance. 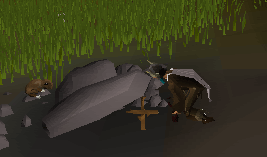 Skillchompas are consumed, even if the action wasn't successful - so they are used rapidly. You will gain 10% bonus XP whenever you use Skillchompas. If an action is unsuccessful, you will still gain 10% base experience of whatever action you were performing. Required Items: Small Fishing Net and a Rope. 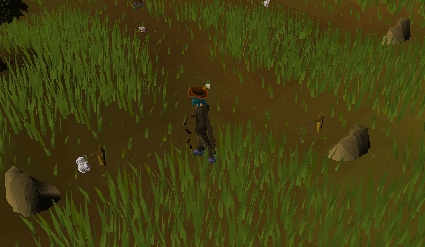 Next head to Lumbridge Swamps and collect 15 pieces of Swamp Tar. While carrying a Pestle and Mortar, use the Swamp Tar with an herb to ground it up and get the tar of the related herb. 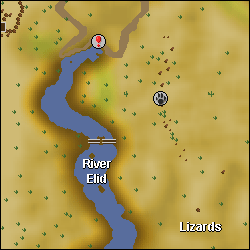 Now go to the location, for the salamander you wish to catch. You need to find a tree which when you select will allow you to lay a net trap. At level 39, you can use a lit torch with your Net Trap to remove your scent and increase to chance of capturing your prey. To be able to use your lizard or salamander as a weapon, you need to wield the herb tar of the creature's choice. Scorch will increase your strength experience. Flare will increase your range experience. Blaze will increase your magic experience. Required Items: Logs, Knife, Teasing Stick. Pitfall trapping are used to capture the larger creatures which cannot be caught using the smaller hunter tricks. 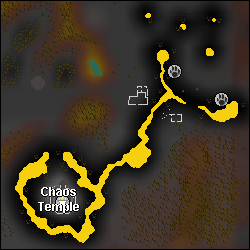 These traps can be set in areas including the jungle of the Feldip Hunter Area (Larupias), northeast of Cairn Isle on Karamja (Graahks), and the snowy Trollweiss Hunter Area (Sabretooth Kyatts). Once you have laid your traps, you need to lay two in case you don't capture the creature the first time, you need to use a Teasing Stick on the creature you wish to capture, and when it is chasing you, jump one of your pitfall traps. The creature chasing you will either walk on it and fall into the trap or jump the trap, and the creatures will not jump the same trap twice, so if it gets by your first one, jump your second and continue going around until you capture it. Lay the Rabbit Snares out in front of burrows in the woodland region, and send the Ferret in a burrow you didn't put a Rabbit Snare in front of. A Rabbit will eventually get caught in one of your snares allowing you to collect your prize. Jungle: If you use a rope on this particular Eagle you will be brought to the Eagles' Dungeon in the Jungle. If you exit this area, you may not turn around because you will fall a little ways from a cliff, that is unreachable unless you have a Thatching Spar obtained from Tai Bwo Wannai Cleanup or a Teasing Stick that you can use with the young vine to help it grow, making it able for you to climb back up into the cave. 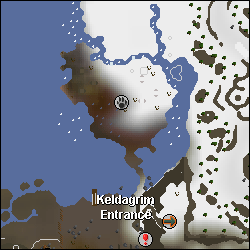 Polar: If you use a rope on this particular Eagle you will be brought to the Eagles' Dungeon in the Snow region. When you exit this dungeon you will appear on a crevice and must use handholds to get down, and this time you can go back up to use the Eagle again, to return to the Woodland. Desert: If you use a rope on this particular Eagle you will be brought to the Eagles' Dungeon in the Desert region, however you cannot exit this dungeon unless you have entered it from the desert at a point in time beforehand, and moved the boulder out of the way. 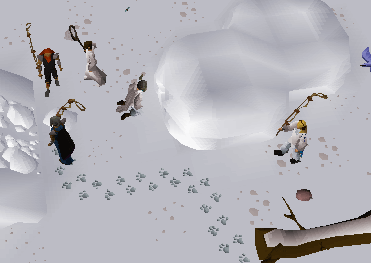 Polar Camo Top: 2 Polar Kebbit Furs and 20gp. 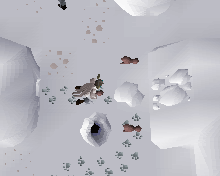 Polar Camo Legs: 2 Polar Kebbit Furs and 20gp. 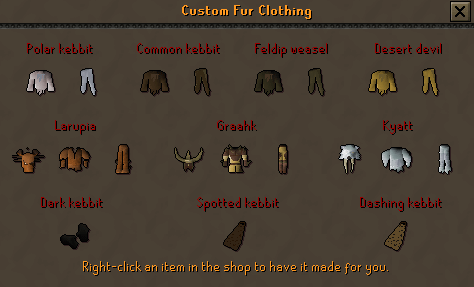 Wood Camo Top: 2 Common Kebbit Furs and 20gp. 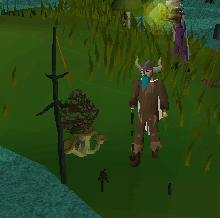 Wood Camo Legs: 2 Common Kebbit Furs and 20gp. 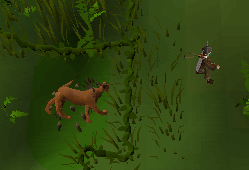 Jungle Camo Top: 2 Feldip Weasel Furs and 20gp. Jungle Camo Legs: 2 Feldip Weasel Furs and 20gp. Desert Camo Top: 2 Desert Devil Furs and 20gp. Desert Camo Legs: 2 Desert Devil Furs and 20gp. Larupia Headdress: 1 Good Larupia Fur and 500gp. Larupia Top: Any one Larupia Fur and 100gp. Larupia Legs: Any one Larupia Fur and 100gp. Graahk Headdress: 1 Good Graahk Hide and 750gp. Graahk Top: Any one Graahk Hide and 150gp. Graahk Legs: Any one Graahk Hide and 150gp. Kyatt Headdress: 1 Good Kyatt Fur and 1000gp. Kyatt Top: Any one Kyatt Fur and 200gp. Kyatt Legs: Any one Kyatt Fur and 200gp. Gloves of Silence: 2 Dark Kebbit Furs and 600gp. 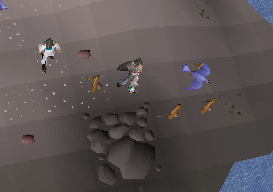 Spotted Cape: 2 Spotted Kebbit Furs and 400gp. 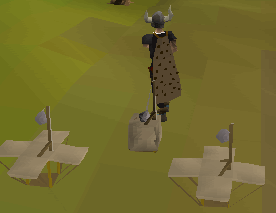 Spottier Cape: 2 Dashing Kebbit Furs and 800gp. Gloves of Silence 54 2 Dark Kebbit Furs and 600gp Increased chance of thieving. Note: Each time you're caught thieving while wearing the Gloves of Silence, they degrade a small amount.